That’s what I said now. Princes, princes who fight for you. One has vibranium in his pockets, that’s some bread now. This one, rides sharks that fire rockets. Ain’t in his head now. But seriously, folks. The two superhero epics that bookended 2018, Black Panther and Aquaman, share some unexpected circumstances. Again… I’m not here to talk about which one is better. They’re both worth watching, they both raked in over a billion dollars globally… although Black Panther made the majority of its money in North America while Aquaman has thus far made 70% of its money overseas… but why compare? They’re like apples and oranges. If apples made over $400 million more at the domestic box office, excited and inspired an entire community of people historically marginalized by the genre, and were likely to be the first fruit to be nominated for Best Picture by the Oscars, while oranges had battle sharks. That said… they do have this one weird major similarity. Both movies are about two men, linked by blood but separated by fate, who each have a claim to the throne of a highly advanced but hidden kingdom. Once currently sits on the throne, having been raised to rule the kingdom; the other is an outsider, visiting the kingdom for the first time, and challenges the other for it. One wants to turn the advanced weapons of the hidden kingdom against the outside world to repay the injustices done to his people; the other, our hero, who made his first appearance in a big team-up movie a while back, wants to find a way to live in peace with the outside world. Their first fight doesn’t go the hero’s way, but he manages to rally and defeat his rival, with the help of a princess who would probably be better at the job than both of these jabronis but doesn’t seem to want it. So… kind if similar, yes. 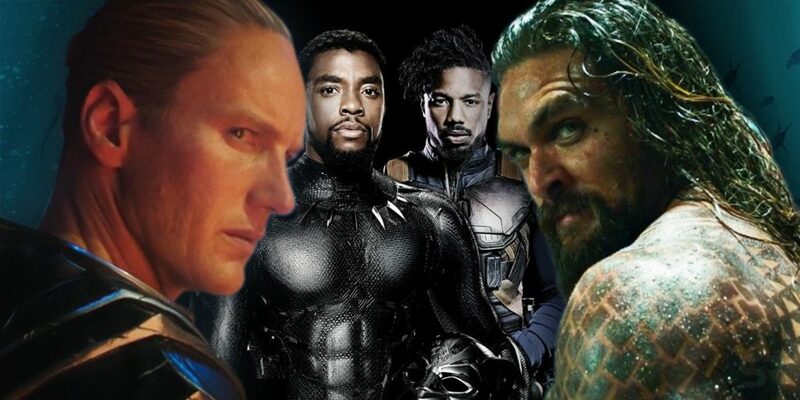 That’s not to say Aquaman is deliberately copying Black Panther, they’re just both movies about kings of made-up places, and this is a pretty easy story to tell in that circumstance. This happens. It happens in Hollywood all the time: this is an industry that released two movies about volcanoes, two movies about asteroids hitting Earth, two animated movies about ants, two other animated movies about fish, always within the same year as each other. And it happens in comic books. For example, the seven-year period from 2004-2011 when Batman and Captain America manged to tell the same story. A long–dead partner of the hero returned from beyond the grave, now a villain; they fight, the hero’s main nemesis becomes involved; the hero is killed as a result of a major crossover; his original sidekick takes over the mantle, for a very well-received run; it turns out the hero wasn’t really dead, merely lost in time; the hero returns, but the sidekick keeps the name because he’s too darn popular. Well, he does until a later big crossover. There are also some notable differences between Aquaman and Black Panther. First off, they switch up which of the hero and villain is the reigning king and which is the outsider. T’Challa has spent his entire life in Wakanda, meaning they need Martin Freeman’s token white guy Everett Ross to serve as the audience surrogate, experiencing it for the first time; Arthur was raised in a lighthouse, so he sees his ancestral home for the first time right alongside us. But bigger than that relatively small detail, there’s a big thematic difference. T’Challa discovers that his ancestors, the previous rulers of Wakanda, up to and including his recently deceased father, weren’t everything he was raised to see them as. That his kingdom has flaws, that their policy of isolationism passively allowed the trans-Atlantic slave trade, among other atrocities against Africa and Africans, historical and ongoing. He has to accept and adapt to his nation’s flaws before he can stand against Killmonger, whose plans will kill thousands if not millions, but has some decent points. Arthur, on the other hand, goes too far in the other direction. He has nothing but scorn for Atlantis, given that his mother, their queen, was executed for fleeing an arranged marriage and having a son with a surface-worlder. What Arthur has to confront is his own flaws. Arthur does good, but he’s a blunt instrument. He goes in swinging, rarely thinking, and that might have served him okay so far (even through Justice League, which they briefly admit happened and then move past as fast as they can), but isn’t enough to stop his half-brother from raising the armies of the oceans against an unprepared surface. In fact, in a well-done subplot, Arthur’s crude actions against pirates in the beginning of the movie only create a worse enemy, Black Manta, whose vengeance Arthur and his new ally Mera (who is, if one were to ask my opinion, the best part of the movie) barely survive. So while he goes through a fairly typical series-of-artifacts-with-clues treasure hunt, he also needs to confront his own failings, and become the hero Atlantis and the world needs. Yes, they both have very similar core plots. Sure, you’re unlikely to find anyone outside of the hardest-core DC fans… and white nationalists… and I wish there was less overlap in that Venn diagram… who says Aquaman did it better, lacking Black Panther’s vision of an advanced African nation that never suffered colonialism. But they have their own takes, and each did it well enough. Next page: You have something against cartoons?